Pears are a member of the rose family of plants (Rosaceae), which, in addition (of course) to roses, contains a long list of fruits including apples, apricots, cherries, etc. The many different varieties of pears commonly found in U.S. groceries all belong to the same category known as European Pear. They are distinct from (but closely related to) the fruit we commonly call “pear apple”. Let’s see some of the amazing health benefits of Pears fruit on this page. The light color flesh of pears is juicy, sweet and usually mild. Its texture is soft and buttery and some varieties have grainy flesh. In structure, pear fruit features bell or “pyriform” shape; around 5-6 inches long, and weigh about 200 gm. Pears fruit is packed with health benefiting nutrients such as dietary fiber, anti-oxidants, minerals, and vitamins, which are necessary for optimum health. They also contain a significant amount of pectin, which is a water soluble fiber. Let’s see amazing health benefits of pears. It is rich in vitamins C and K, as well as the nutrients like copper that acts as an antioxidant in order to protect cells from the damage caused by free radicals. They contain antioxidant and anti-carcinogen glutathione which help prevent high blood pressure and stroke. The high vitamin C and copper content act as good anti-oxidants that protect cells from damages by free radicals. 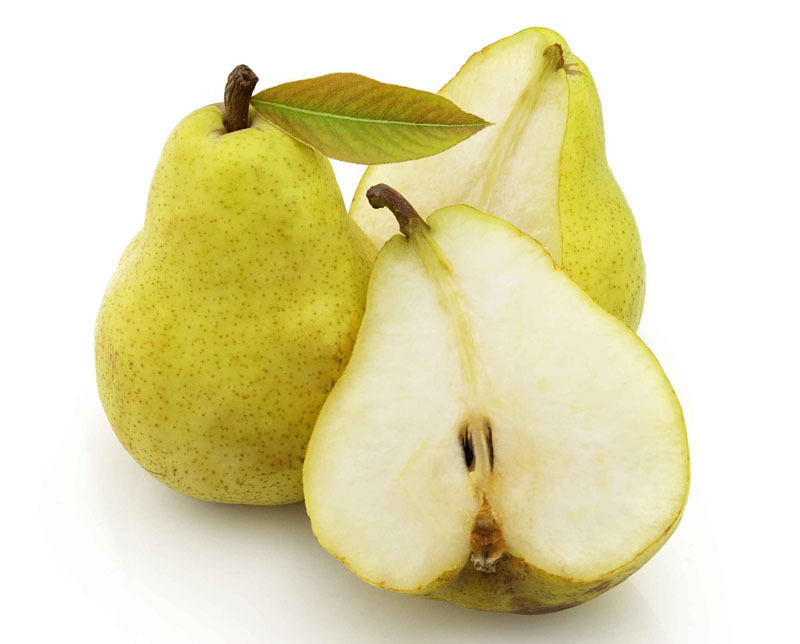 Pear fruit is one of the very low-calorie fruits; provides just 58 calories per 100g. A low calorie but high fiber diet may help bring significant reduction in body weight, and blood LDL cholesterol levels. The presence of both soluble and insoluble fiber in this fruit helps to protect us from the development of type 2 diabetes. It is a rich source of dietary fiber and fiber is very effective for the heart. Fiber leads to reduce the level of bad cholesterol by binding with bile salts that are generally prepared from cholesterol and carry them out of the body. The anti-oxidant nutrients in it are critical in building up your immune system. Drink pear juice when you feel a cold coming. The pectin in them is diuretic and have a mild laxative effect. Drinking pear juice regularly helps regulate bowel movements. The cooling effect in pears is excellent in relieving fever. The best way to bring a fever down quickly is by drinking a big glass of pear juice. Health Benefits of Pears in removing the birth defects. For a pregnant woman, folic acid is essential for keeping the baby safe from birth defects. Folic acid present in pears can help you in this issue and during the pregnancy one must consume this fruit on a regular basis.